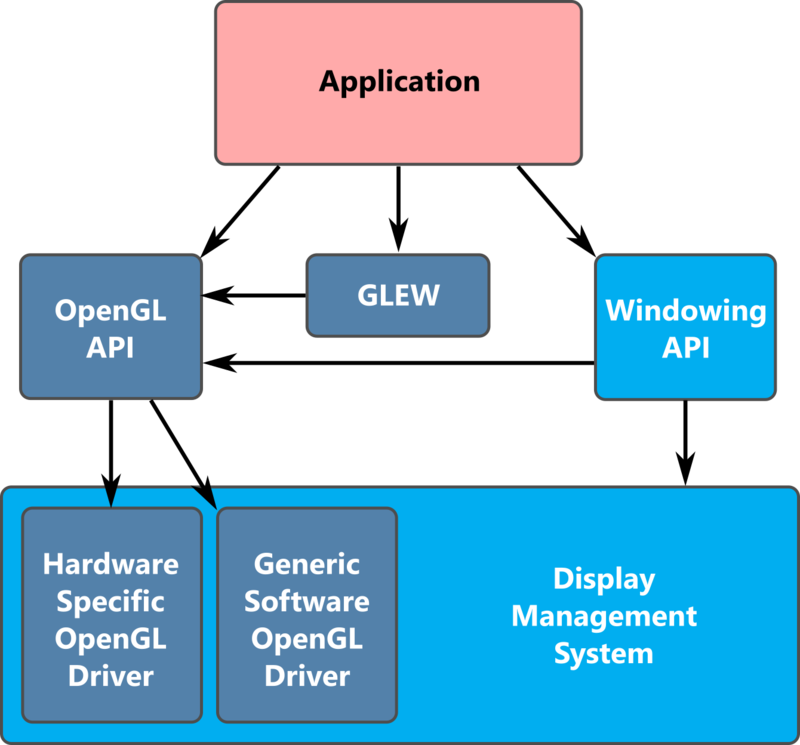 A short overview of general OpenGL architecture. A short overview of the structure of an interactive program. How to create a simple WebGL canvas program from scratch. How to add some better WebGL rendering. How to submit your work as a web page on Hercules. Read the remaining contents of this lab material. Complete your first WebGL program. Set up your work to share on Hercules. Demonstrate that your shared page displays on both a lab computer and another. Submit your code and question answers to URCourses. 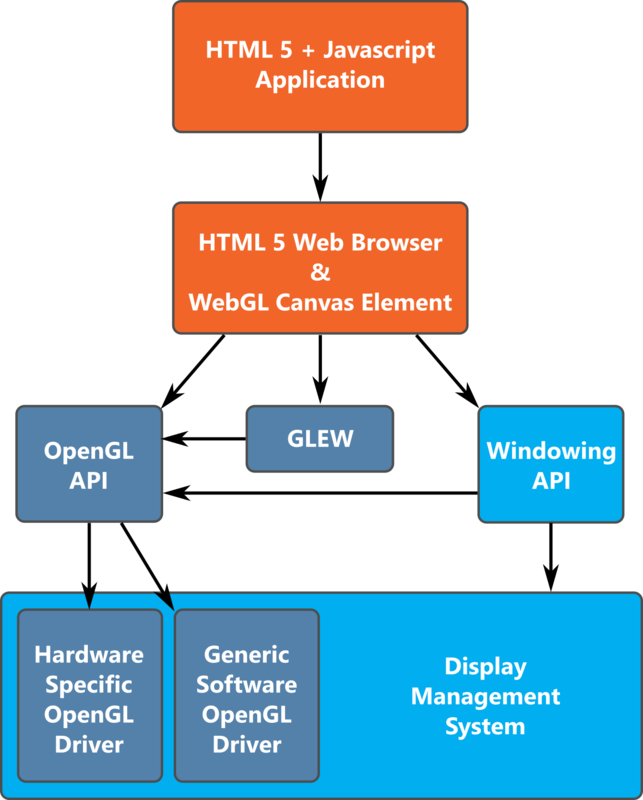 Block Diagram of Typical Application / OpenGL / OS interactions. OpenGL is the definitive cross-platform 3D library. It has a long history. It inspired Microsoft's Direct3D (D3D) API, and both evolved together from supporting fixed function graphics accelerators to supporting modern programmable hardware. The modern OpenGL style, and the one most like recent versions of (D3D), is known as Core Profile. A simplified predecessor to OpenGL's Core Profile features inspired OpenGL ES 2.0 - by far the most popular low level 3D API for mobile devices. OpenGL ES 2.0 was, in turn used as the basis for WebGL, which you will be learning in this class. By learning WebGL, you will learn a low level graphics programming style that is common to all modern OpenGL flavours. Especially if you stick to the same programming language, switching between versions is not too hard, and porting code can be easy if you modularize properly. Windowing API functions specifically developed to support OpenGL are used to set up, shut down, and handle event signals for an OpenGL drawing area called a Rendering Context (RC) in a window or component . These functions may be defined by the operating system, a third party widget set, or by a cross platform OpenGL library. This is the API for this class. Everything you need is built in, including automatic selection of the best drivers for your platform. More on this later. For years, GLUT was the API used in most OpenGL courses, including this one. Old lessons used classic fixed function OpenGL with GLUT 3.7, while newer lessons used freeglut or Apple GLUT to get access to Core Profile functionality. You can find the GLUT based version of these labs here. OpenGL API functions defined in gl.h and provided by the active OpenGL driver (specified by the RC) are used to draw. GLEW is a popular utility used to easily expose new OpenGL features. This is very important for Windows programs, since Microsoft stopped caring about OpenGL at version 1.1 (current version is 4.5). It is also useful for checking for OpenGL capabilities and extensions on other OSes. OpenGL Drivers implement the details of OpenGL functions either by passing data directly to 3D hardware, performing computations on the main CPU or some combination of the two. When you write a WebGL program, many of these details are hidden from you. In fact, your WebGL calls may not even be executed by an OpenGL driver. On Macs, where OpenGL support is built-in to the OS, WebGL calls are translated directly into their OpenGL equivalents. 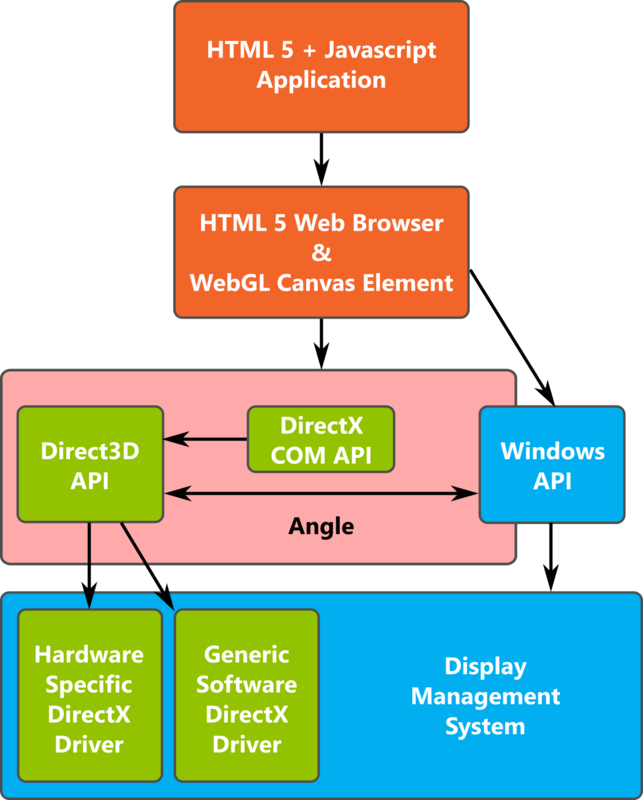 On Windows, DirectX/D3D 9 or better has been built-in to the OS since Vista, so a special layer called ANGLE — developed by Google specifically for WebGL and used by Chrome, Firefox, IE11 and Edge — is used to translate WebGL API commands into equivalent D3D9 or D3D11 commands. On Linux, driver support is EXTREMELY important — most browsers only support nVidia's official drivers. "Ideal" WebGL Application / OpenGL / OS interactions. Windows WebGL Application / "OpenGL" / OS interactions. ANGLE's translation from WebGL to D3D is good, but not perfect. If you want a "pure" OpenGL experience on Windows, and you think your graphics drivers are up to it, learn how to disable ANGLE at Geeks3D. Try one of Dr. Angel's samples, or one of my experiments, to see if WebGL is working for you. If it isn't, then try following the advice in Learning WebGL Lesson 0. We will not go into detail on exactly how everything works in this week's lab. Instead we will focus on getting to the point where you can begin drawing, then use HTML UI elements to interact with the drawing. B. Overview of an Interactive Program. The Model: all the data that are unique to your program reside there. This might be game state, the contents of a text file, or tables in a database. The View: it is a way of displaying some or all of the model's data to user. Objects in the game state might be drawn in 3D, text in the file might be drawn to the screen with formatting, or queries on the database might be wrapped in HTML and sent to a web browser. The Controller: the methods for users to manipulate the model or the view. Mouse actions and keystrokes might change the game state, select text, or fill in and submit a form for a new query. Object-oriented programming was developed, in part, to aid with modularising the components of Model-View-Architecture programs. Most user interface APIs are written in an Object Oriented language. Model consists of descriptions of the geometry, positioning, apperance and lighting in your scene. Ideally these could be saved to and loaded from a file, but we won't do that much in this lab. View consists of the OpenGL rendering calls that set up your rendering context, interpret the model, and send things to be drawn. Controller is usually a set functions you write that respond to event signals sent to your program via the Windowing API. In your simplest programs your Model and View will be tightly coupled. You might have one or two variables set up that control a few things in your scene, and the scene itself may be described by hard coded calls made directly to WebGL with only a few dynamic elements. Eventually you will learn to store the scene in separate data structures. Acquire Rendering Context: how you perform this step is determined by your Windowing API. Set initial OpenGL scene settings: OpenGL's default settings are useless. An important part of the drawing pipeline, the shader program is missing. You will need to load, compile and activate one. It is also desirable to preload some objects you want to draw into data buffers and connect them to your shader programs. You may also need to enable, disable or configure various OpenGL settings to suit your rendering needs. Rendering - the function that does this is Windowing API specific, but the OpenGL code will be completely generic and should be copy/paste portable. There are other events you will frequently handle as well. If you place your program in a resizeable window it is very important to respond to size change events. If you don't, your rendered result will be distorted or incorrect when the window is resized. You may also wish to respond to mouse motions, clicks, key strokes, and HTML controls. Though WebGL is the API of choice for this course, you will always use textbook libraries to make certain parts of the program easier to write. 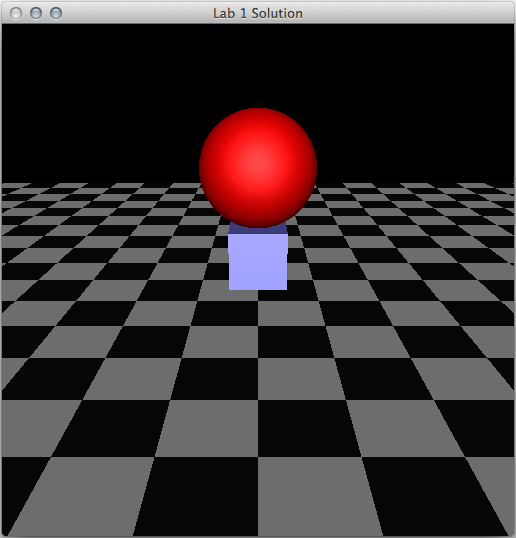 Follow these instructions to learn how to set up a textbook style WebGL program. Create a root folder for all your labs. Name it something meaningful like "WebGL_Labs". Create a folder inside called "Common"
Copy all the files from Dr. Angel's Common folder to your Common folder. Make sure you use the latest version so you get his bugfixes. What are these files? Read the README.txt file! For the lazy - here's a .zip file with this structure set up using the January 2016 files. Create a folder for this week's seminar. Name it something meaningful like "Lab1". Use your favourite web browser to open the HTML file you saved. It should "just work". // All vertex shaders require a position input or "attribute". // The name can be changed. // Other attributes can be added. // gl_Position is a built-in vertex shader output or "varying". // Its value should always be set by the vertex shader. 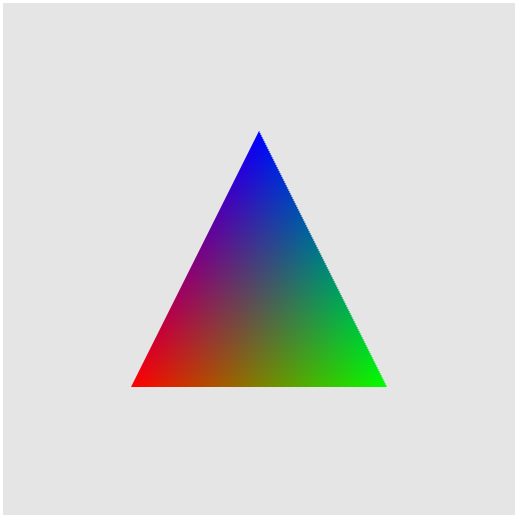 <!-- This in-line script is a fragment shader resource. // Sets default precision for floats. // Required, since fragment shaders have no default precision. // Choices are lowp and mediump. // In general it should be set, but this is not required. The first three are the textbook libraries. Using your favorite editor, create a new HTML file called Lab1Demo.html in the Lab1 folder and paste the above code into it. In this part, add or change the highlighted code in the template code. // Here, 2D vertex positions and RGB colours are loaded into arrays. // Actually, the  WebGL automatically clears the screen before drawing. // This command will clear the screen to the clear color instead of white. // Our triangle has three vertices that start at the beginning of the buffer. Click here to see a page with the working WebGL result instead of a picture. The triangle is OK, but you probably want Real 3D Graphcs. Let's do that. I do not expect you to understand everything that's going on here, but you should be able to understand enough to use this as the basis for your exercise this week. 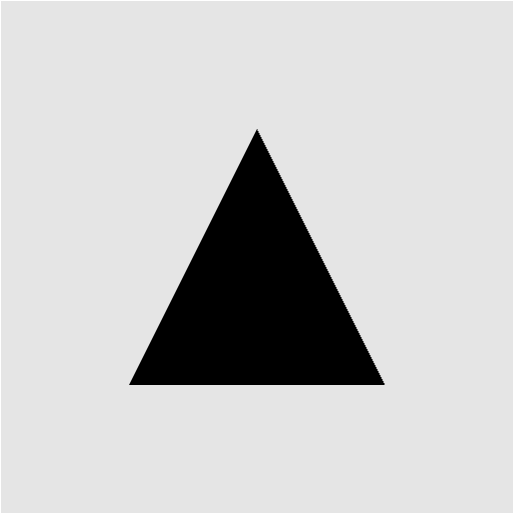 Use the same fragment shader as in the triangle demo program. The one in the template will make everything black. // Set default light direction in shader. //Allow variable controlled rotation around local y axis. // define four vertices that make up a square. //     Your playground. Code additional scene details here. // right side matrix multiplication. // and a three part rotation axis with x, y and z components. // Sphere is centered around current origin. // and created a new "local frame"
// Argument refers to length of side of cube. // Cube is centered around current origin. This code depends on uofrGraphics.js, a library that simplifies the drawing of a few basic shapes. Download it and add it to your Common folder. Don't forget to link in uofrGraphics.js in your HTML file. You should also remember to link your Lab1Exercise.js WebGL program. You can now test your program. Click here to see what it should look like. Let's make the program a little more interactive. Add this select element (menu) to your HTML page, right after the canvas tags. Attempt to run your project. If something went wrong, reread the notes. Or berate the lab instructor. That might work too. If your result looks and works like this, congratulations! You are now ready to begin the exercise. Make sure you learn how to publish your work before proceeding. If your program runs correctly, you might be wondering how exactly the picture is drawn. That is, you might want to understand how each function works. Well, you do not have to worry too much about this in the first lab. Over the rest of the semester we will go through these subjects one-by-one in detail. Of course, we will learn some even more advanced functions and features too. Change public_html's permissions to 711 - that's rwx--x--x. You can list, modify, and enter the folder, but others can only enter. Copy your WebGL_Labs file structure to Hercules. Change the permissions of Lab1 and Common to 711 just like public_html. That's the permissions you should use for all folders. Change the permissions of all files inside those folders to 644 - that's rw-r--r--. You can read and write, but others can only read. To be completed and submitted to URCourses by the first midnight one week after the lab. Try to make these changes to the RenderScene function. This is a taste of things to come. For help with the function calls read the comments carefully and consult with your lab instructor. Move the red sphere (urgl.drawSolidSphere) up so that its bottom is exactly 0.5 units above the checkerboard. Make the blue cube (urgl.drawSolidCube) half as big and position it directly below the sphere. It should be a perfect fit. You may add other objects to the scene if you wish, but please keep the blue cube and red sphere visible. Kinds of things trigger events - is it always a user interaction? Change the direction of rotation with a mouse click or button press. Change the speed of rotation with a slider. Extra: Try more than one. You have seen a lot of stuff so far and you may be confused about all the libraries used in this lab's program. Take a moment to learn about them. What is HTML5 and why is it exciting? What is WebGL based on? Name one classic OpenGL Windowing API and provide a link to it. What files are in the textbook's Common folder, and where do they come from? What is in uofrGraphics.js and who wrote it? Working WebGL folder structure including Lab1 and Common folders with all code with modified box/sphere position and your new event handler/UI element. Published WebGL project on Hercules. Please use the filenames provided in the lab notes, that way you don't need to provide links. Document with written answers to the "Think About Event Programming" questions. Document with written answers to: "Learn About the CS315 Libraries"